Highland Airs Alpaca Ranch is a farm located in Hackettstown, New Jersey owned by Colin & Joy Scott. 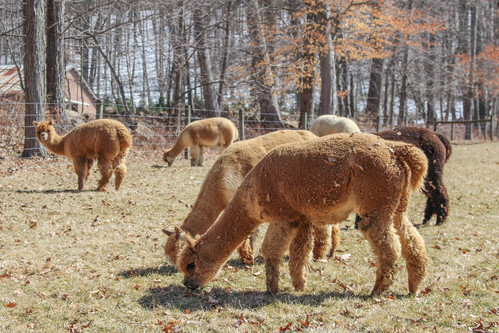 Highland Airs Alpaca Ranch, set on 30 acres of peaceful woodland in Hackettstown, NJ, is home to 23 alpacas, 1 llama, an alpaca gift store, one husky, and two very passionate owners. 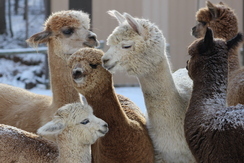 Visiting with us and meeting our beautiful alpacas is a wonderful and fun outing for family and friends alike. 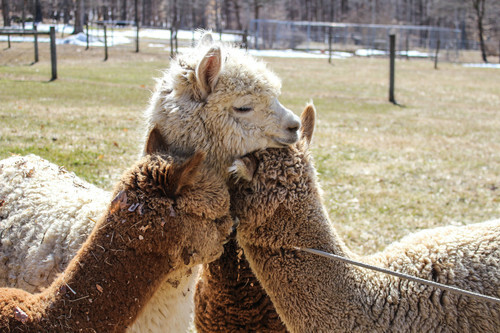 We offer tours of our barns, in depth halter training and opportunities to walk the alpacas and feed them by hand. We also offer free brochures that give you information on these wonderful animals. Visiting Highland Airs Alpaca Ranch is a great way to spend part of your day and to make some fluffy, new friends. We hope to see you soon! A long long time ago in a land far away called Colorado, Colin attended the National Western Stock Show. While looking for ideas for an article he was writing on retirement he met a lady who was showing alpacas at the show. The curious cuddly animals held great appeal for him and a long discussion ensued. The lady suggested to him to visit Daryl Goodrich at Angel Woods Alpaca Farm in his home of New Jersey. A great friendship began and in November of 2013 when Daryl retired, Colin and his wife, Joy bought the farm. Since taking over ownership of the farm, Colin and Joy have worked hard to make upgrades to the existing infrastructure. 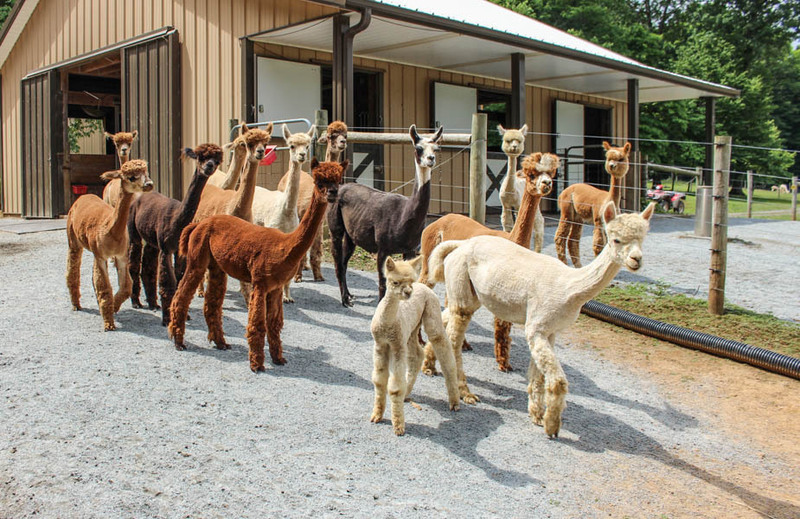 In addition they have continued to spread the name and brand of Highland Airs Alpaca Ranch throughout their surrounding community as well as becoming very active within the online alpaca community. In just their first year they have found success within the show rings, expanded their herd size, held events for the community, made some fantastic friends, and have opened a store on sight. The store itself has been a successful endeavor and the possibility to expand the business on all fronts is always a tempting move. Most importantly for Colin and Joy, they have become diligent students when it comes to proper and responsible care for their alpacas and everyday feel fortunate to have taken a risk on joining the alpaca community. The joy they get from caring for their alpacas is equal to love that they feel for each and every one of them. HAAR are going to be very focused on the production of high quality fiber. Having a science background, they are very interested in joining the ranks of other pure fiber enthusiasts and will be breeding and gearing their herd towards these goals. 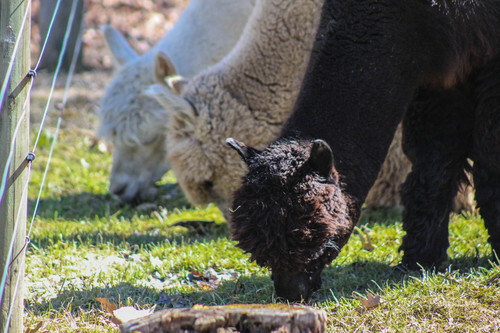 They will continue to play host to events for their community, look to expand their store and of course, never go a day without loving their alpacas unconditionally.